Another Easter, and another great visit to La Muela! 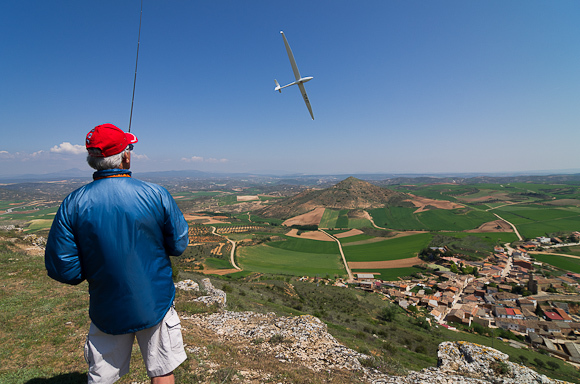 Fifty one pilots from all over Europe attended the F3F competition this year. The competition was very well organised and despite the lack of flying on the second day, we got in more than enough rounds to get a result. The only problem was the weather interruption towards the end of the first day which led to inevitable grumbles depending on which side of the rain one was flying! Nevertheless the top positions were well deserved, with Andreas Fricke taking the crown. Apart from the competition and great sport flying, the trip was also notable for the fantastic hospitality we received from our Spanish friends, so my special thanks to them - gracias, nos pasamos muy bien! Variable conditions on the first day caught out some of the top pilots. How to get a smile on your face! Food stuff. Bar stuff. Serious stuff! Includes some images I shot during an excursion to Valverde de los Arroyos, in the 'Arcitectura Negra' region. It's a strange mixture of Wales and Switzerland, with its chalet-style houses made of stone and with slate roofs. It's about 30 minutes drive from La Muela. As usual we stayed in the Hotel Infante in Guadalajara. It's near the old part of the town. Humanes is the last town of any significance before you reach La Muela, and it's where we go for provisions.